What Else can I Expect From an Online Associate in Fire Science Program? 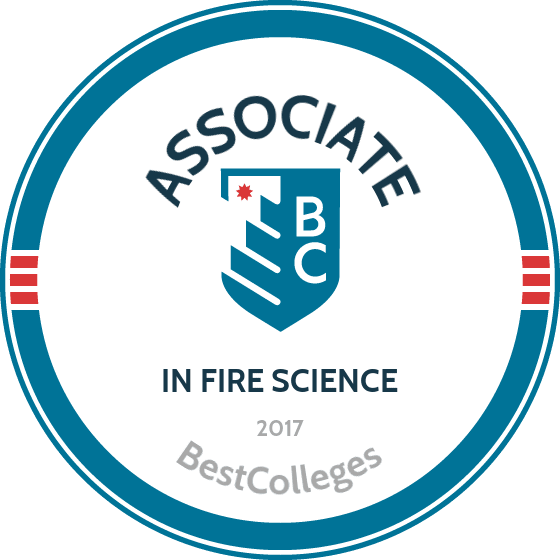 WHAT ARE THE BEST ONLINE ASSOCIATE DEGREES IN FIRE SCIENCE? What Can I Do With an Associate Degree in Fire Science? Fire science is the study of fire combustion and behavior, strategies for combating fire, fire prevention and protection systems, fire safety codes, and firefighting. Professionals in fire science and emergency services keep people safe from natural fires and arson. An associate degree in fire science provides you with foundational knowledge about what causes fires and how fires behave in various conditions. Students gain the skills necessary to prevent fires and manage emergency situations. According to the Bureau of Labor Statistics, job prospects for firefighters and fire inspectors are projected to increase by 5% and 6%, respectively, from 2014 to 2024. Curricula for online fire science associate degree programs vary by school and concentration. Generally, these programs require 60 credit hours, comprising general education, major, and elective courses. Distance learners can complete most programs in two years. WHAT WILL I LEARN IN A FIRE SCIENCE PROGRAM? Although specific course requirements vary by program, below are three common major requirements in online fire science associate degree programs. Fire behavior and combustion: This course reviews the physical and chemical properties of fire, the scientific process of fire burning, and the components of water as a fire suppressant. Students learn how fires ignite and burn so they may better strategize to prevent and extinguish them. Introduction to fire prevention: Students explore fire safety inspection procedures, the history and philosophy of fire prevention, and standard practices for fire safety education and preparation. Principles of fire and emergency services: This course introduces students to the structure of fire and emergency service organizations, including the components involved in preventing and responding to fire and emergency situations. HOW LONG WILL IT TAKE ME TO GET MY ASSOCIATE DEGREE IN FIRE SCIENCE? Generally, earning an associate degree in fire science online requires 60 hours of coursework completed over two years. However, studying part-time can delay completion time, whereas taking more than the average course load can shorten the time required. Transferring credits from other schools can also expedite program completion. By transferring previous college coursework or dual enrollment credits, students may begin major requirement classes much sooner and complete their online fire science associate degree quickly. Some schools offer cohort-based programs, while others allow you to go at your own pace. In cohort programs, students who are admitted in the same year take courses together, where they build relationships and learn from one another. Individually paced programs allow for flexible start and end dates. Odessa College offers an associate in applied science in fire administration that prepares certified firefighters to enter supervisory and upper management positions in the field. This online fire science associate degree includes courses that can help students pass the written state certification exam, which is perfect for those who are not already certified. The curriculum includes courses on a variety of topics, such as firefighter health and safety, public education programs, and the legal aspects of fire protection. Students must also complete a general education curriculum that includes courses on English, government, mathematics, and the humanities. This 60-credit fire administration program can be completed in just five terms. Students must pass all of their courses with a minimum 2.0 GPA through the program to graduate. Those who live in the same district as Odessa pay much lower tuition than other distance learners. Odessa is accredited by the Southern Association of Colleges and Schools Commission on Colleges. MCC offers an online associate degree in fire science that trains students to assume leadership roles in fire protection. Students learn about the basic chemistry of a fire and the skills used in fire suppression. This online fire science associate degree also includes study of fire department administration, which makes it ideal for experienced firefighters who want to take their career to the next level. This program also prepares graduates for positions like fire investigator and fire alarm system installer. This 62-credit program includes 15 credits of general education requirements and 47 credits of major coursework. Major courses cover a variety of topics, such as fire hydraulics and water supply, building construction for fire protection, philosophy of fire protection, and clinical rotation for the basic EMT. Students must maintain a minimum 2.0 GPA and earn at least 15 credits from MCC to graduate. MCC is accredited by the Higher Learning Commission. Lanier Tech offers a fire science program that is ideal for fire service personnel at any stage of their career, whether they are first-time students or certified firefighters seeking to become leaders in the field. This online fire science associate degree delivers a mix of occupational and academic knowledge and requires students to complete general education courses as well as program-specific courses on topics like fire administration, firefighting strategy, and arson investigation. Students can enter this program during every semester as long as there is space available. Distance learners are expected to maintain an average 2.0 GPA or higher throughout the program to graduate. Applicants must have either a high school diploma or GED and submit ACCUPLACER, SAT, ACT, COMPASS, or ASSET test scores to be considered. Lanier Tech is accredited by the Southern Association of Colleges and Schools Commission on Colleges. Albany Tech offers a fire science associate degree online that is intended for both experienced firefighters and those planning to become certified. This program prepares first-time students for entry-level careers in the field, and helps those with prior firefighter experience command senior positions in fire service management. This 62-credit program includes general education requirements and 47 credits of upper-division coursework on a variety of topics, such as fire service building construction, incident command, and fire administration. Applicants must have either a high school diploma or GED and submit ACCUPLACER, COMPASS, ASSET, SAT, or ACT scores to be considered. They must also take an entrance exam and have earned a minimum 2.0 GPA in high school English and mathematics. Albany Tech is accredited by the Southern Association of Colleges and Schools Commission on Colleges. Casper offers an associate degree in fire science online program that teaches students the skills needed to pursue entry-level roles in fire service and prepares them to transfer to a bachelor's program at four-year school. Students who are new to the profession can obtain certification while earning their associate degree. The curriculum includes courses on a variety of topics, such as wildland firefighting, advanced rescue practices, and fire-related codes and ordinances. Students can also participate in this program's unique clubs and organizations that provide hands-on exposure to communities in the Casper, Wyoming area. This 60-credit program can be completed in just two years of full-time study. Applicants must have a high school diploma or GED and submit ACT or SAT scores to be considered. Casper is accredited by the Higher Learning Commission. NOVA offers a fire science associate degree online program that assists fire professionals with their career development goals. This degree is intended for individuals who are already certified firefighters and want to pursue senior-level positions in the field. Past graduates from this associate of applied science in fire science technology have gone on to successful careers in public sectors fire services as well as private sector loss prevention firms. Students who have prior fire department training experience can receive advanced standing credits, which shortens the amount of time it takes them to earn their degree. NOVA offers opportunities for students to transfer to four-year baccalaureate programs in fire science, public safety, or emergency management. The school requires students to take English and math placement tests before registering for classes. NOVA is accredited by the Southern Association of Colleges and Schools Commission on Colleges. Delta offers an online fire science associate degree that helps students develop technical and vocational skills that improve their employment opportunities. This associate of applied science in fire science technology offers three separate tracks: firefighter technician, emergency medical services, and leadership and training. All three tracks share the same core occupational courses and includes a semester of customized classes. This program prepares students for a variety of professions, including jobs as firefighters, fire investigators, emergency medical technicians, and paramedics. Delta offers a variety of financial aid options, including loans and scholarships as well as workshops that help students determine the best options for financing their education. The college also boasts a student-to-faculty ratio of 18-to-1, ensuring that all students receive individualized attention. Delta is accredited by the Higher Learning Commission. SAU Tech offers an associate degree in fire science online program that provides students with a well-rounded education in all the essential areas of firefighting, including fire suppression, hazardous materials, and emergency medical services. The 60-credit curriculum consists of 45 credit hours of general education classes in English, math, science, and history, as well as 15 credit hours of occupational courses in strategies and tactics, fire administration, and legal aspects of fire service. SAU Tech has a matriculation agreement with Southern Arkansas University that enables students to transfer their credits to earn a bachelor's degree in business with a fire science management minor. Applicants must be certified and either be employed by, or volunteer with, the fire service in Arkansas. They must have a high school diploma or GED and submit ACT, SAT, ASSET, COMPASS, or ACCUPLACER scores to be considered. SAU Tech is accredited by the Higher Learning Commission. Augusta offers a 62-credit fire science technology degree is intended for fire service employees who are pursuing more specialized roles and responsibilities in the supervision of fire and rescue personnel. This 62-credit associate degree in fire science online program includes 15 credits of core courses on topics like written and oral communication, which help firefighters respond to the needs of individual in emergency situations. Students must also complete 47 credits of occupational classes on topics like fire science supervision, hazardous materials, and incident command. This program can be completed in just six terms, include one summer semester. Applicants must have a high school diploma or GED to be considered. Students must graduate with a 2.0 GPA or higher in all required courses to graduate. Augusta Tech is accredited by the Southern Association of College and Schools Commission on Colleges. Chattanooga offers an online fire science associate degree that trains students to become fire service professionals who specialize in the preservation of life and property. This 60-credit program also offers three concentrations: fire suppression, emergency service supervision and administration, and emergency medical care. Students learn about the diversity and complexity of emergency service work through a sequence of general education and technical core courses that can be taken either online or on-campus. Chattanooga graduates are prepared for careers in rescue organizations, hazardous materials organizations, industrial fire protection, and private fire protection companies. Applicants must have a high school diploma or GED and submit COMPASS, ACT, or SAT test scores to be considered. Chattanooga State is accredited by the Southern Association of Colleges and Schools Commission on Colleges. While firefighters generally have a high school diploma and emergency medical services certification, those who have earned an associate degree in fire science online are prime candidates for higher positions in fire and emergency services organizations. For instance, fire inspectors generally have firefighting experience and postsecondary education, and many departments prefer candidates for fire chief and captain positions to have a relevant associate or bachelor's degree. Below are three jobs that often require an associate degree or higher. Fire inspectors ensure that buildings and other facilities are up to code and adhere to fire safety regulations. This job requires strong communication skills. Fire inspectors travel to conduct inspections in various facilities and may develop and present fire safety education programs. A fire chief handles the administrative aspects of fire prevention, safety, employee training, and emergency response procedures. While they also perform firefighting and rescue operations, these tasks are secondary to management responsibilities. A fire captain manages a crew of firefighters, training new firefighters, inspecting and ordering equipment, and occasionally engaging in firefighting and rescue operations. Higher level positions often require higher levels of education. For positions like fire chief, candidates with a bachelor's degree are typically preferred. These positions also come with higher salaries; fire inspectors make about $50,000 per year, while fire chiefs earn up to $122,000 per year. Below are three bachelor's degree programs applicable to the fire science and emergency services field. A degree in emergency medical services prepares graduates to work in emergency medicine or perform related managerial duties. The program covers topics like EMS administration, disaster management and event planning, and EMS legal issues. A fire administration program prepares students to think tactically about fire prevention, safety, and emergency response. The curriculum focuses on community risk reduction, the structure of fire safety organizations, the implementation of fire safety plans and education, and how fire behavior affects emergency response situations. A forensic science program introduces students to the analysis of forensic evidence and crime scene investigation. Combined with a fire science degree, this degree is useful for the investigation of arson crimes. On average, salaries for fire science professionals increase by about $10,000 over 20 years of work, with greater growth potential for positions with managerial or administrative duties. For example, salaries of emergency management specialists usually increase about $20,000 over 20 years. In both entry-level and managerial positions, an employee's experience affects annual earnings. The table below illustrates salary growth as professionals gain experience in the field. Professional organizations provide opportunities to network with other professionals in the field, participate in national disaster relief efforts, obtain training and certificates, and discover new careers. Information about fire behavior and the best fire prevention and investigation techniques is being constantly updated. Professional organizations help members stay up to date with changes in the field. Below are three professional organizations in fire science and emergency management. This organization provides information on legal and labor issues, continuing training and education in the field, and disaster relief efforts around the world. This agency coordinates the federal government's prevention tactics and response efforts to domestic disasters, from natural disasters to acts of terrorism. This organization comprises fire investigators who prevent and solve arson cases. The organization provides training and certification programs, as well as publications on innovative fire investigation techniques. Financing and funding opportunities for fire science students include scholarships, loans, grants, and work-study programs. Fire science scholarships are often available from professional organizations, educational institutions, and charity organizations. Ask if your professional organization or school offers scholarships for fire science students, and complete the FAFSA to see if you qualify for federal aid.